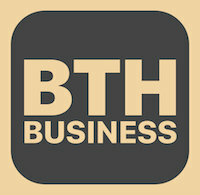 BTH Bank is pleased to offer the new Business Mobile App for business customers. The free and easy to use Business Mobile App offers the same vital functions as the BTH Bank Personal Mobile App, plus the added ability to approve Wires and ACH Batches from your phone or mobile device. To get started, simply download the free BTH Bank Business Mobile App through Google Play or the App Store on your mobile device. A data plan is required for use.